Christie’s New York salesroom was stunned by the 18:56-minute bidding war that led to a $450.3 million sale for Leonardo da Vinci’s Salvator Mundi. 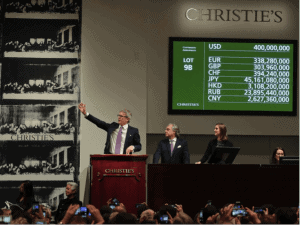 While seated on the front road, I could hear gasps and sceptic comments as the bids that climbed by tens of millions: “Jesus Christ” was the reaction of mega art dealer Larry Gagosian; “Can you believe it? It’s Wild” expressed the collector and philanthropist Eli Broad. 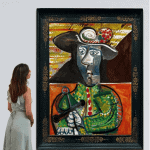 David Nahmad, worldwide renowned dealer and collector, commented that this would destroy the contemporary art market. 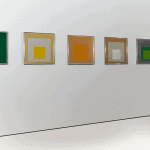 Everyone expected that this painting might draw some trophy hunter’s attention to other periods; yet, Nahmad underestimates how truly big is the contemporary art market outside the walls of the auction houses. Unlike Contemporary art, which has unlimited forums, the Old Master’s sector uses auctions as one primary referral due to the limited supply and lack of venues specialized in this area of study. And still, this sector is not a 100% safe bet, since the Leonardo was sold “as is”. We wonder if the buyer is going to make good of it, as rumours of condition and authenticity are flooding around several critics and scholars, including the da Vinci expert Frank Zöllner of the Musee du Louvre.